High Reliability: The long-life diaphragms and the absence of packings in the fluid section guarantee high reliability, even under the most taxing working conditions. The air-cooling system for the hydraulic stage keeps the hydraulic oil at a constant temperature and viscosity. Cobra® is an exclusive high pressure double diaphragm pump suitable for Airless and AirCoat applications up to 250 bar. 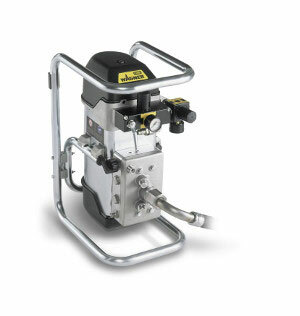 Cobra® is the first high pressure pneumatic pump without packing. The lack of contact between the material and the external atmosphere (the pump is completely sealed), the absence of friction in the fluid section and the minimum shear make it perfect for any kind of material including the most critical ones such as reactive paints (UV paints, isocyanates, acrylics) or highly abrasive materials. The pump works with extremely low pulsation and creates a uniform paint flow, achieving a perfect spray pattern and superb surface quality. With its minimized internal volumes, the pump is designed to greatly reduce solvent consumption and material waste during flushing and color-change operations. An IceBreaker® pneumatic motor pressurizes the hydraulic section with a ratio of 40:1. The oil contained in it, transmits the pressure to the pumped fluid through the two diaphragms. While one diaphragm creates a suction, the other delivers the material. Special inlet valves and the sturdy diaphragm construction allow high frequency operation. While this would be problematic for the fluid section of a standard piston or bellows pump, it is readily mastered by the Cobra® high speed. A high delivery rate is therefore achievable with a very small pump volume. Cobra® 40-10 is the ideal solution for working with small quantities and frequent color changes - recommended for single-gun up to three-gun applications in the wood and furniture industry, small carpentry shops and joineries, and the general metal industry. Cobra® 40-10 is also ideal for feeding base or hardener for 2K mixing units (FlexControl and FlexControl Plus). Cobra® 40-25 is suitable for high flow rates applications (up to 5 l/min) such as multi-gun operations or for very large nozzles. It is also an excellent solution for feeding automatic spraying systems in wood coating lines or for heavy-duty applications in carpentry, the metal industry, and leather coating. Cobra® 40-25 is ideal for feeding base or hardener for 2K mixing units when high delivery is needed. Cobra® 2K is the perfect solution for highly reactive 2K materials such as polyester (primer or finishing, short and long pot-life) and is ideal for applications on old-style furniture, coffins, musical instruments, and boat and yacht interiors. 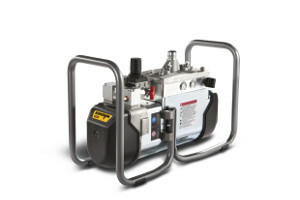 WAGNER Cobra® is the only high pressure pneumatic diaphragm pump on the market. The pump was specifically designed to ensure the highest reliability and the best performance. Smaller displacement volume and the easy-to-clean design which allows for drastic reduction in solvent consumption during flushing operations. Special long-life diaphragms and tungsten carbide inlet valves have high reliability and low maintenance costs. Very low pulsation for consistent fluid output allows for better finishing results. Proven WAGNER IceBreaker® air motor technology which allow for no ice problems even at the highest operating speeds. Integrated recycle valve for easy operation. All Cobra® pumps can be mounted horizontally or vertically. A variety of suction systems can be mounted: hopper, flexible suction hose, and rigid suction pipe which create a versatile operating, space saving design. Compared to standard piston and bellows pumps, the double diaphragm technology combined with small fluid chambers ensures far lower pulsation and a constant material flow. Cobra® 2K is the perfect solution for mixing and for highly reactive 2K materials such as polyester (primer or finishing, short and long pot-life) and is ideal for applications on old-style furniture, coffins, musical instruments, and boat and yacht interiors. In fact, due to the packing-free and no-friction construction, Cobra® 2K solves the typical problems of the traditional 2K bellows pumps, reducing drastically the maintenance costs and solvent consumption. Cobra® 2K is available on a base frame, wall bracket or trolley, and is fully equipped with double suction hoses; recycle valves and a static mixer. The WAGNER spray-gun program optimally combines economical coating with high surface quality. We offer manual and automatic guns for the Airless, AirCoat and air atomization processes, with or without electrostatic support or high speed rotary atomizers. WAGNER offers a wide range of advanced paint mixing and metering systems. Besides the innovative TwinControl 2K units, the FlexControl family offers additional features such as automatic color change, recipe storage, peripheral equipment interfaces, and low and high pressure applications with a very high mixing accuracy. Further information on Cobra® and on a wide variety of accessories like air caps, nozzles and hoses can be found in our online catalog or by contacting Kirkco's application engineer.